Are you looking for crowd control fixtures that everyone will see? 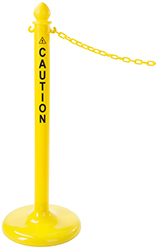 These outdoor plastic stanchions are made for blocking off hazardous areas and directing foot traffic. Each post is made from durable materials for extended use outside, but there's nothing stopping you from using them indoors as well. Outdoor plastic stanchions are excellent for parks, festivals, parking lots, and zoos but their design suits convention halls and lobbies as well. All of these sturdy fixtures feature a bold finish that's easy to see no matter where they're placed. 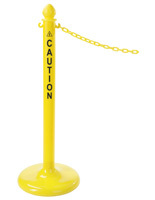 Use these outdoor plastic stanchions to create a safe environment or just keep passersby on the intended path. What makes these high visibility crowd control fixtures different from the rest? The outdoor plastic stanchions have a weather resistant construction for use outside. The rust-proof posts don't even have to be taken in during inclement weather! Place these molded barrier poles outside at concerts, art festivals and theme parks without worrying about potential damage. Each of the posts features a striking finish that's hard to miss. This includes bright colors like yellow, blue, and orange as well as neutral black and white. The poles are also fade resistant, keeping their noticeable shade after years of use, both outside and in. 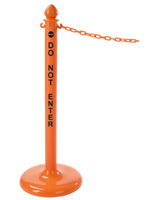 We offer durable crowd control posts with an included chain barrier. Form lines, block areas, and divert traffic with a 6.5' long cord that connects two units together. Also included are two C-hooks for holding chains. 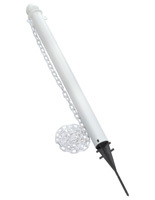 Our plastic stanchions are easy to move from place to place, weighing a little more than a pound. Quickly disassemble the posts for travel to a new location or for when it's time to store them away. Just screw the pieces together, no tools are required! Even though these plastic stanchions are lightweight, that doesn't mean they'll be knocked around during use. 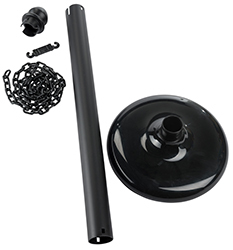 Each standing fixture has an empty base that can be filled with sand for up to 15.5 lbs. of weight! Some post and chain kits feature bold messages to inform passersby. Signs include "Wet Floor", "Do Not Enter", and "Caution" with bright colors and black or white text that stands out. Weather resistant stanchions are available in two different designs, one with a floor standing base and another with a ground stake. The first looks like any other crowd control fixture and are easy to place by simply setting them down. Stanchions with a ground stake are different, they're made to be planted in grass, dirt, or sand. This is ideal for festivals and parks where there's a lot of natural terrain. There's no need to worry about the poles falling over on uneven footing since they'll be firmly rooted in the ground. Simply use a hammer to hit them into the earth. 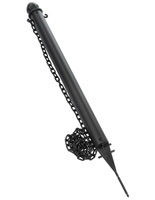 These durable, portable stanchions are great for extended use outside. While they are weather resistant, their bright colors, strong construction, and easy-to-move design make them a popular choice for indoor use as well. Floor standing units are ideal for catering halls, event venues, and convention centers where they can form orderly lines. The safety models are great for warning pedestrians about spills and other hazards. Order on StanchionsDirect.com for fast same day shipping and bulk pricing!